Tiger Bill Reviews Modern Drummer Festival 2008 4-DVD Set from Hudson Music. I had the opportunity to hang backstage at MD Fest 2008, which was videotaped by Hudson Music using multiple cameras, and it was an incredible weekend. So I was really looking forward to this Hudson video release. It turns out to be 4-DVDs plus a printable 28-page eBook, totalling nearly 12 hours of footage! Let's check it out. A free-form fusion specialist, known for his work with The Mars Volta, Thomas opens up with an extended free-form solo. His informative clinic segment includes a discussion and demonstration on dynamics, which he uses quite effectively during his solo and throughout the performance with his trio consisting of Michael Aaberg on keyboards and Ambrose Akinmusire on trumpet. He also covers his use of single bass pedal and variations on fills inspired by some of his personal favorite artists such as Dennis Chambers and Steve Gadd. Following his performance, Bill Miller (Editor in Chief of MD and Festival Host) gives Thomas a plaque to commemorate his winning of the Modern Drummer Magazine Readers Poll for Up and Coming Drummer of 2008. Sadly, Bill Miller passed away barely three months after the Fest - losing his battle with cancer that had on-going for a number of years. Thomas plays a Drum Workshop Drumset consisting of 7 drums and a single bass pedal, Zildjian Cymbals, Evans Drumheads, HQ Percussion, Puresound Percussion, and Vater Drumsticks. Long-time friend Billy Ward, one of the world's leading clinicians and performers who has worked with numerous artists from Joan Osbourne to Robbie Robertson to Bill Champlin to yours truly at my own DrumBeat Festival in 2007, opens his set with a performance of "String Theory" featuring Barry Coates on guitar and Bill Urmson on bass. The ever creative Billy begins with one brush and a mallet before switching to sticks. Next up is "Song for Jo" that, as Billy says, uses a technique he loves which is playing very softly. He plays the entire tune with his hands making only brief use of a single mallet. The other selections in his jazz set are "Riding Nomad," "Out The Door," "Comfort Me," and "Beddy Bye Time," in which Billy makes use of various sticks, mallets, and brushes including some that are home-made. All in all this tasty musical set demonstrates why Billy is one of the most sought after musicians in the business. Billy plays a Drum Workshop Drumset consisting of 5 drums and a double bass pedal, Zildjian Cymbals, Evans Drumheads, HQ Percussion, Puresound Percussion, Trueline Drumsticks, Shure Microphones, Focal Professional Monitors, and Rhythm Tech Percussion. Will, who came to fame working with Living Colour, opens his set with an extended solo that mixes contemporary with African styles and makes use of electronics in addition to acoustic drums and percussion instruments. For his next selection, "Trance," Will plays along to a pre-recorded track featuring vocals and lots of electronic sounds. Next, it's back to the extended solo format during which Will makes use of polyrhythms, ostinatos, and electronic effects. For "Emanation" Will employs a uniquely triggered electronic drum pad with an extensive guitar-like foot pedal setup that allows him to incorporate drum loops into the mix. He then moves back to the kit to accompany the electronic loops before moving back to his electronic pad making use of extensive esoteric percussion instruments and even a Bawa flute, which results in a standing ovation. Will plays a Mapex Drumset consisting of 8 drums (with two bass drums), SABIAN cymbals, Remo Drumheads, Vic Firth Drumsticks, and Audix Microphones. Ndugu, who has worked with an extreme range of artists from Miles Davis to Michael Jackson and Santana to Weather Report, opens by playing an extremely extended solo starting with his hands on the drumset and incorporating mallets, brushes, and sticks. Nudugu, who has been playing professionally for 43 years, discusses his concepts of groove and his secrets of making hit records as a studio musician - Starting with his advice to not play the drums - "Play the music!" Ndugu plays a Yamaha Drumset consisting of 7 drums with a single pedal plus a set of Timbales, Paiste Cymbals, Toca Percussion, Remo Drumheads, Vic Firth Drumsticks, and Shure Microphones. Saturday's show concludes with Philips, who has performed with artists such as The Who, Toto, and Jeff Beck. He plays a set of progressive rock music with his band Protocol (Andy Timmons on guitar, Everette Harp on horns, Steve Weingart on keyboards, and Del Atkins on bass). Simon's clinic segment consists of a discussion and demonstration of the Clave. This is followed by a tune that he wrote using the Clave but in a time signature of 7, featuring Billy Ward on shaker and Ndugu on timbales - neither of whom had rehearsed with the band nor even heard the tune before! This brought the audience to their feet. Simon concludes his set with "Indian Summer" another odd time signature piece with Protocol and receives another standing ovation. Simon plays a Tama Drumset consisting of 15 drums (including two bass drums), Zildjian Cymbals, Remo Drumheads, Pro-Mark Drumsticks, and Shure Microphones. Thomas Pridgen and Walfredo Reyes, Sr.
Carmine makes a special appearance to open the second day of the Fest with his new Drum Show - SLAMM, which elecits a standing ovation from the audience. SLAMM features Carmine as the Master of Madness on drumset and snare battle, Veronica Bellino (The Dynamo) on buckets and trash can lids, Felipe Torres (Diablo) on drumset, Zolio Ruis (Z-Man) on buckets and snare battle, Walker Adams (The Politician) on trash cans, and Artay Dillion on guitar. SLAMM appears courtesy of Ddrum Drums, SABIAN Cymbals, Vic Firth Drumsticks, Hansenfutz Pedals, Alfred Publishing, Aquarian Drumheads, and Shure Microphones. Jason Bittner (of Shadows Fall) introduces Metal drummer Derek Roddy. Derek, extreme metal drummer with Serpents Rise and Traumedy, demonstrates his approach to metal drumming. His set includes a combination of playing to some Serpents Rise tracks (written by Roddy) and Traumedy tracks plus a clinic segment where Derek discusses and demonstrates his approach for developing speed, endurance, and precision on the drumset. Derek plays a Sonor Drumset consisting of 9 drums (with two bass drums one of which uses a double Axis pedal), Meinl Cymbals, Remo Drumheads, and Vater Drumsticks. Dafnis, drummer with Michel Camilo, opens with an extended solo that incorporates polyrhythms, ostinato patterns, dynamics, and control. Composer/drummer Prieto then performs his own original Latin/Jazz style compositions with his sextet that show incredible originality. The educational segment includes a demonstration of Dafnis playing a continuous Clave ostinato while vocalizing, in various meters and tempos, against it. The Dafnis Prieto Sextet consists of Avishai Cohen on trumpet, Felipe Lamoglia on alto sax, Peter Apfelbaum on tenor sax and melodica, Manuel Valera on piano, and Charles Flores on bass. Dafnis plays a Yamaha Drumset consisting of 5 drums with a single bass pedal, SABIAN Cymbals, Latin Percussion, Vic Firth Drumsticks, Evans Drumheads, HQ Percussion, and Puresound Percussion. Todd, drummer with Styx and Brian Wilson, opens with a track in 13/8, which culminates in an extended solo featuring a combination of chops balanced with musical taste, which brings the audience to their feet. Todd answers some audience questions and then concludes with a final track, which (despite having some trouble with his laptop) brings an appreciative audience to their feet. Todd plays a Pearl Drumset consisting of 8 drums with a double bass pedal, SABIAN Cymbals, Remo Drumheads, Pro-Mark Drumsticks, and Audix Microphones. Simon Phillips introduces Gavin Harrison. Gavin, drummer with Porcupine Tree and King Crimson, in his first solo drum performance in the USA plays to some tracks. He also takes questions from the audience that include his approach to odd time signatures, which he performs as easily as most drummers play common time. He concludes by performing a track dedicated to his father who passed away nearly 20 years to the day of the Fest. Bill Miller awards Gavin a plaque for winning the Modern Drummer Readers Poll for Best Progressive Rock Drummer of 2008. Gavin plays a Sonor Drumset consisting of 7 drums with a double bass pedal, Zildjian Cymbals, Remo Drumheads, and Vic Firth Drumsticks. Bill, who has worked with artists like John Scofield and Pat Metheny, performs some straight ahead swinging jazz with his quartet featuring Seamus Blake on tenor sax, Kevin Hays on piano, and Doug Weiss on acoustic bass. All songs were composed by Bill Stewart except "Badlands," which was penned by Seamus Blake. Bill plays a Gretsch Drumset consisting of 5 drums with a single bass pedal, Zildjian Cymbals and Drumsticks, Gibraltar Hardware, and Remo Drumheads. 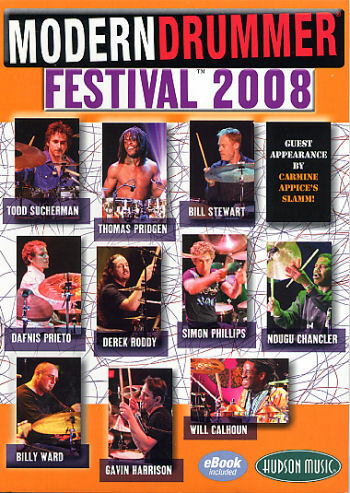 As always, Modern Drummer Magazine does a Class A job of producing their Drum Festival and the 2008 Fest was one of the finest yet. Drummers of all ages and experience levels will find much inspiration among the nearly 12 hours of footage on this massive 4-DVD set. And the 28-page eBook PDF file that contains transcriptions of many of the exercises and grooves demonstrated in the Saturday and Sunday Interviews is an extra added bonus.